Well, this probably won’t be one of the longer reviews I write. 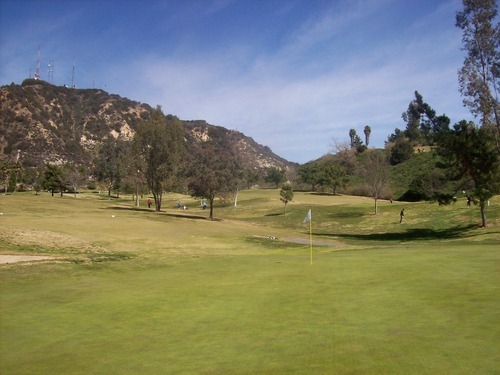 It wasn’t long ago that I played Scholl Canyon Golf Course in Glendale as part of the LA Golf Group I belong to. 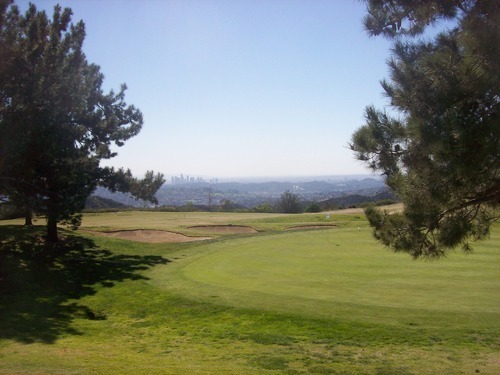 We played out there last summer in our “Three-Club Monte” event, where players are limited to just three clubs in their bag the entire round. This small, but tricky little executive course turned out to be a decent option for this format, so we chose to play it again yesterday. 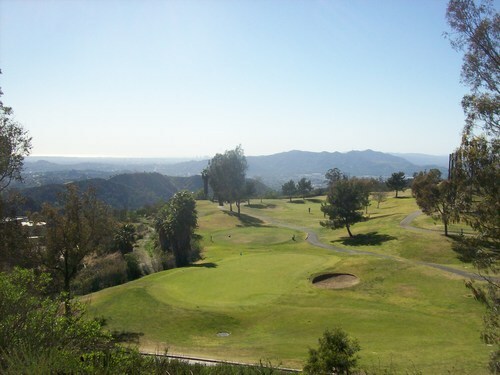 There are only a six par-4 holes at Scholl Canyon, with only one of those being over 300 yards. 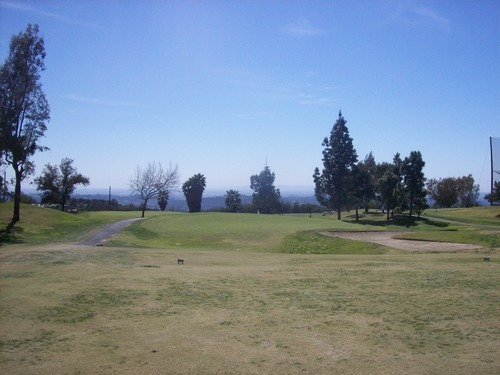 Most of the par-3 holes are short, ranging from about 60 yards up to 120. Then there are a couple that play a little longer. So for their three clubs, most people chose to bring a 150-yard club, a wedge and a putter, and that suffices pretty well out here. One wrinkle this year is that extra points were being offered to those brave enough to play with only one or two clubs instead of three. A few guys dared and seemed to fare decently. I played with all three, but didn’t play well and I won’t dwell on that. Just a continuation of the funk I have been in all winter. 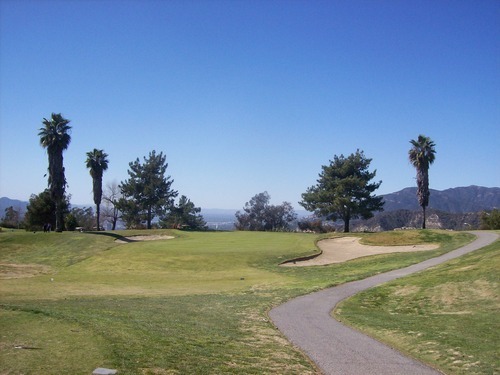 The front nine at Scholl is pretty flat and fairly forgiving, but the back nine is definitely more interesting and challenging. 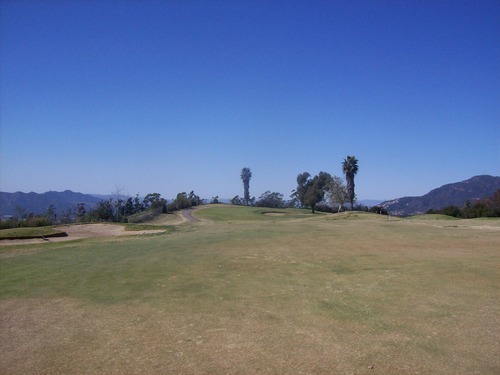 There are tight fairways with severe side slopes, a few small forced carries and plenty of ups and downs as you traverse your way through the small canyon. 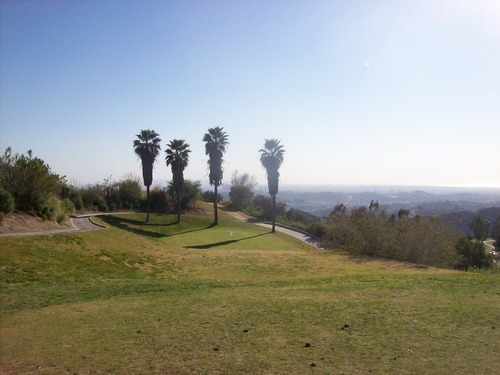 Most players chose to walk this short course, but the back nine (especially the Stairmaster-esque jaunt up the hill between holes 11 and 12) is definitely a nice little workout going up and down the hills. On some levels, this is a fun little course. On others, it’s frustrating with some holes that are quite funky. 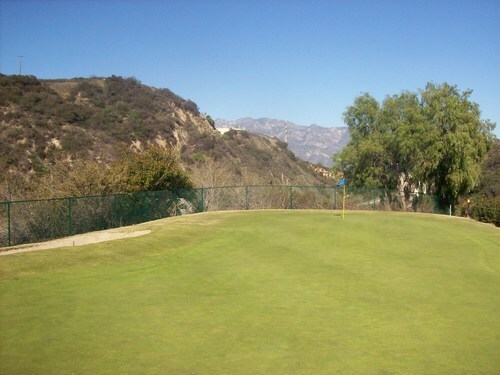 The biggest challenge at Scholl Canyon is the greens. There are very few flat spots on any of them, so putting here is always an adventure. Add to that the fact that the greens were especially firm and fast yesterday and several pins were in downright evil positions, making them very hard to hold and forcing plenty of three-putts (and even a few four-putts and five-putts) from our big tournament group. At some point early on, we just went with it and were able to laugh it off from there on out. Nobody in the group is super serious or competitive, so we just had fun on these circus-like greens. 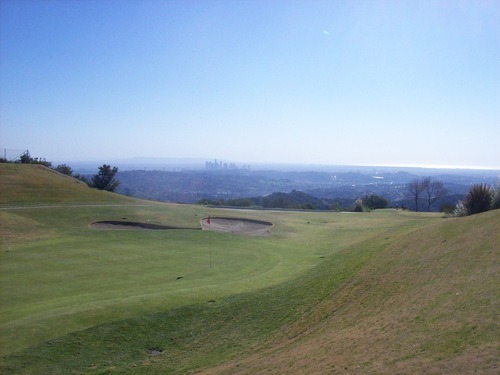 The bad news is that the course overall was in pretty poor condition. The fairways were dead/dormant/brown/thin and extremely firm and fast. With the hilly terrain, the extra roll-out was generally more harmful than helpful. It was very easy to roll into trouble, even on good shots off the tee. The rough was pretty patchy and mostly pretty shaved down, as well, so it wouldn’t do much to stop you from running into the canyon on some of the tight back nine holes. 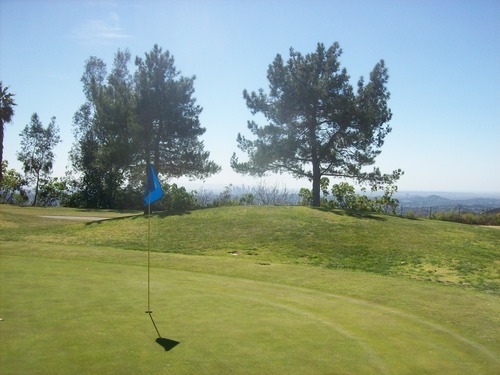 The greens, although firm, were in decent shape, but they were covered in small rocks and coarse sand from the bunkers. The bunkers themselves were pretty brutal. What little sand there was on the top layer had already been sprayed out on the greens! The weakest part condition-wise was the tee boxes. There were hardly any level spots to be found and they were very chewed up with most people playing short irons and wedges off of every tee. And for some reason, they had a few of the tee boxes set up extremely tight. On the 18th hole in particular, the blue markers were probably about six feet apart at the most. That just felt rather awkward to me when there was plenty of room to work with. I guess they just try to keep the damage as limited as possible in one area since they know they are going to get so chewed up on a daily basis. 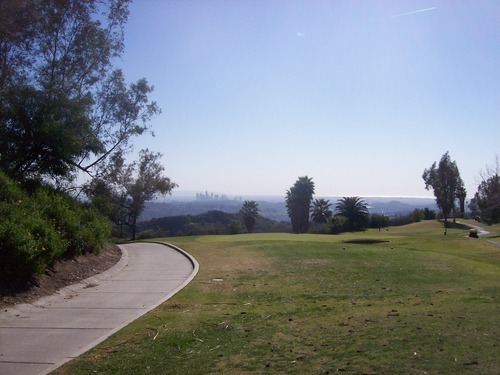 For $18 to walk on a Saturday afternoon, Scholl Canyon is what it is. 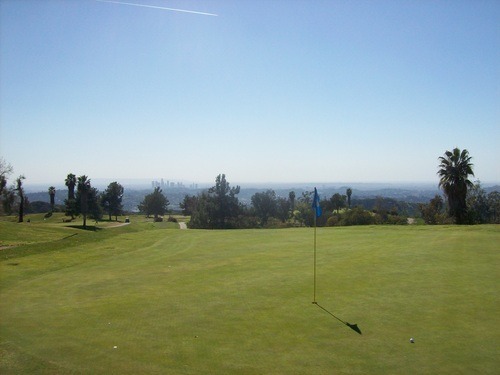 It’s a cheap muni executive course that is best suited for beginners and casual players. Serious golfers who prefer typical-length regulation layouts will probably not enjoy this course too much. 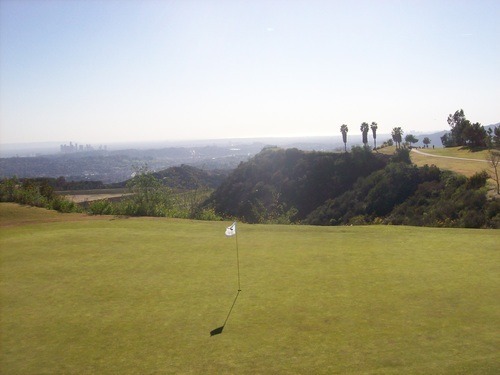 It works OK for the three-club format we played and if I did live near there, I’m sure I’d head out from time to time for an after-work super twilight round because of the favorable pricing. Now, despite plenty of negative things about Scholl Canyon, perhaps the biggest positive is the location high up on the hills of Glendale. 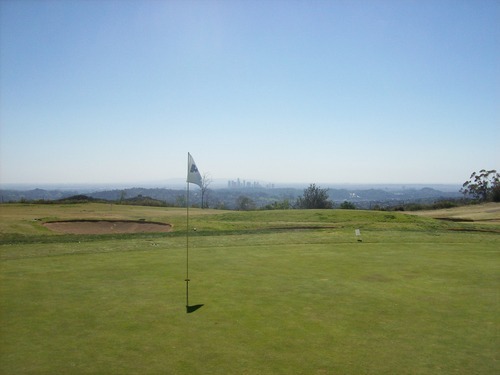 There are some excellent views of the Los Angeles skyline and the entire sprawling valley below. Last time, the weather was a bit too hazy to get any good views. 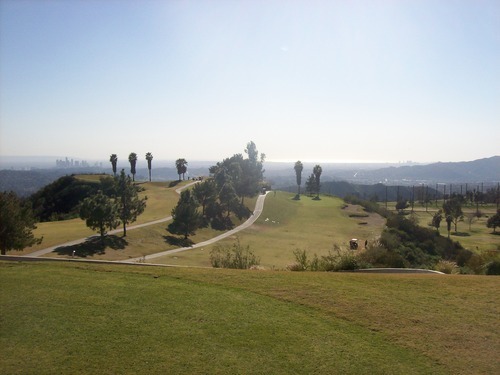 It was a little hazy yesterday, but we could see all the way out to the ocean and you get some really neat views throughout the entire course. You’ll see the city in just about every picture below. On top of that, with the Academy Awards in town last night, it was kind of cool to be overlooking the entire city all afternoon knowing one of the world’s biggest events was about to happen right there. Okay, I guess I lied. This review turned out longer than I expected. Oh well.